Get back to your roots with the OXO Good Grips Wooden Salad Servers. 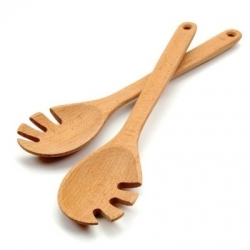 Made of solid beech wood, these sturdy Salad Servers are comfortable and durable. The large, contoured handles and flared tines make it easy to toss or lift salad at any angle. The solid side of the head is perfect for scooping up vegetables, fruits, croutons and more. These tools are not recommended for use in the dishwasher.